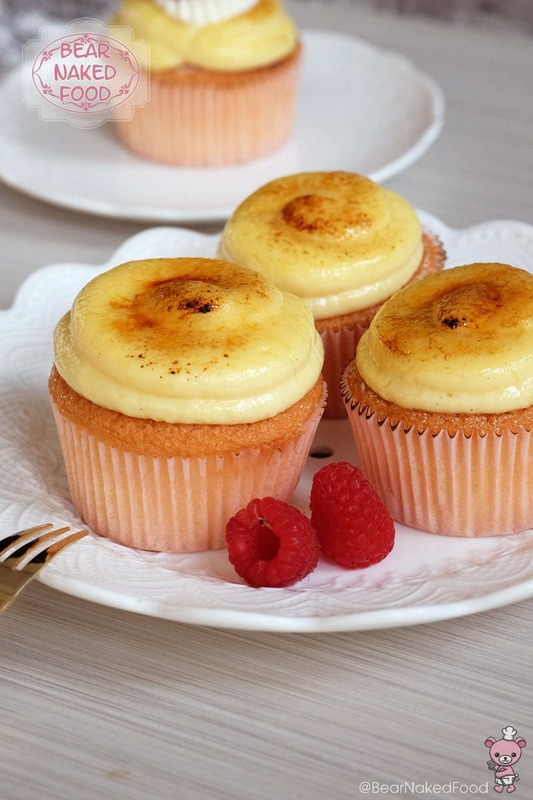 Crème Brulee is such big hit at our household that we are finding different ways to enjoy it. 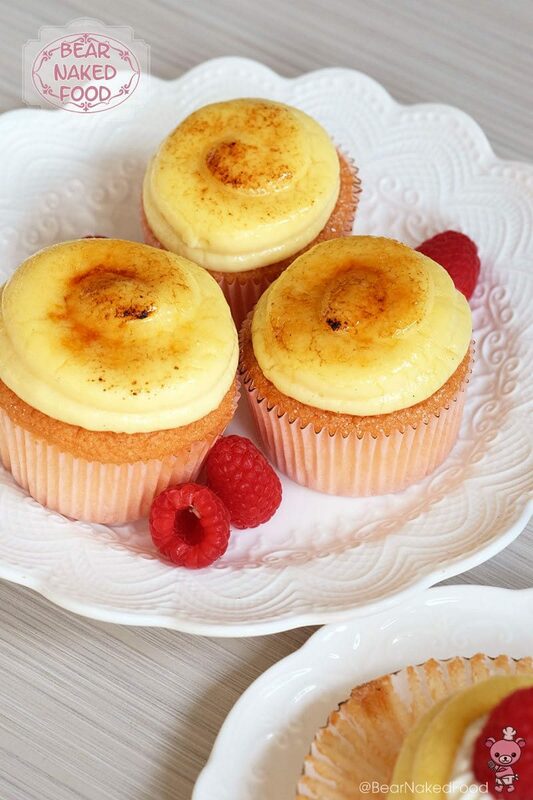 Inspired by The Baker Chick, I combined my all-time favorite Vanilla Sponge Cake recipe with my chocolate éclair pastry cream filling and made these oh-so-pretty Crème Brulee Cupcakes. The steps might look lengthy and all but in reality, it is really not that daunting. The line up for cupcakes. The line up for pastry cream. 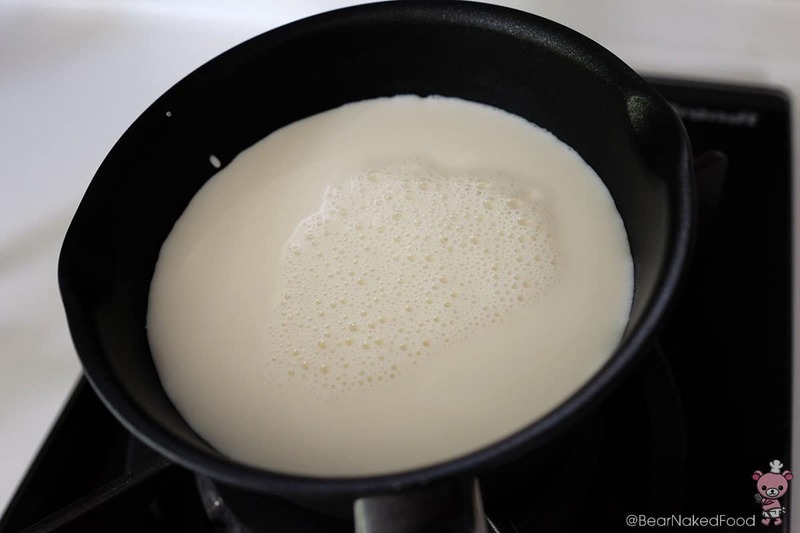 Heat the milk in a medium saucepan until hot and steaming. It is not necessary to bring to boil. 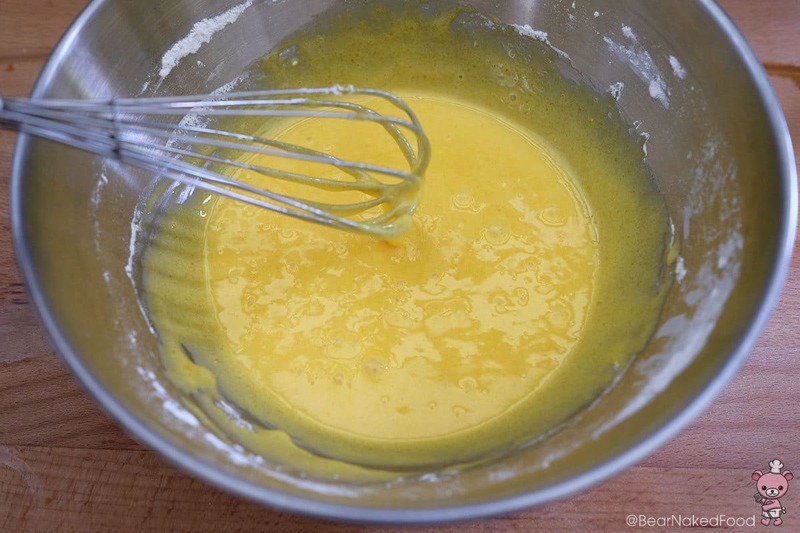 In a large bowl, combine the egg yolks and sugar together and whisk until sugar dissolved. Add in both flours and mix until combined. Pour ¼ of the hot milk into the egg mixture and stir continuously to temper the egg yolks and prevent them from scrambling. Pour in the rest of the milk and whisk until well incorporated. 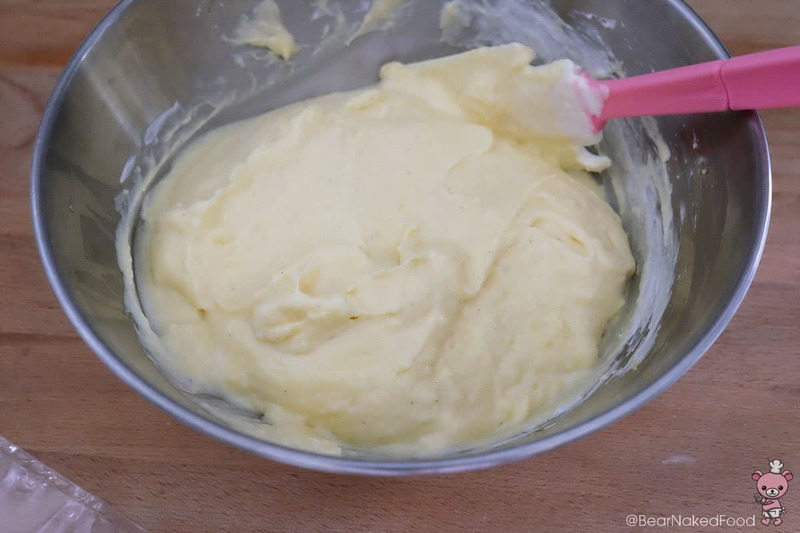 Transfer the egg milk mixture back into the saucepan and cook and stir continuously until it just thickens into custard. 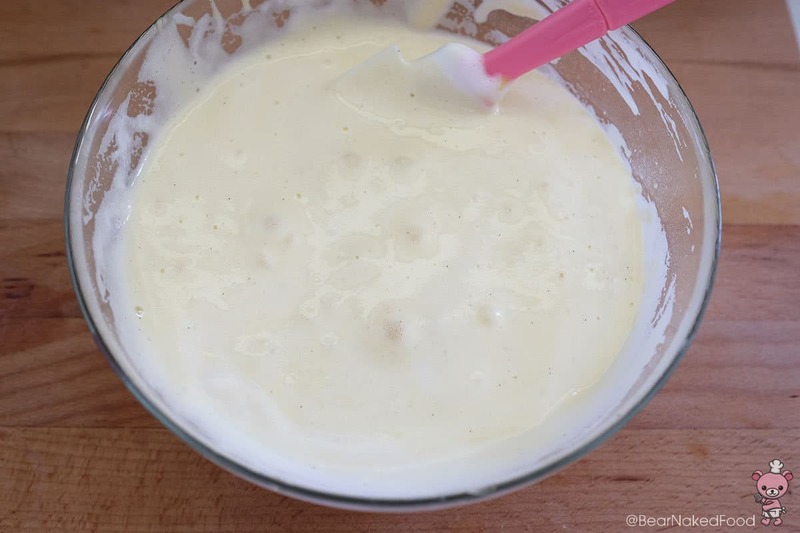 Turn off heat immediately and keep stirring as the heat will continue to cook the cream. 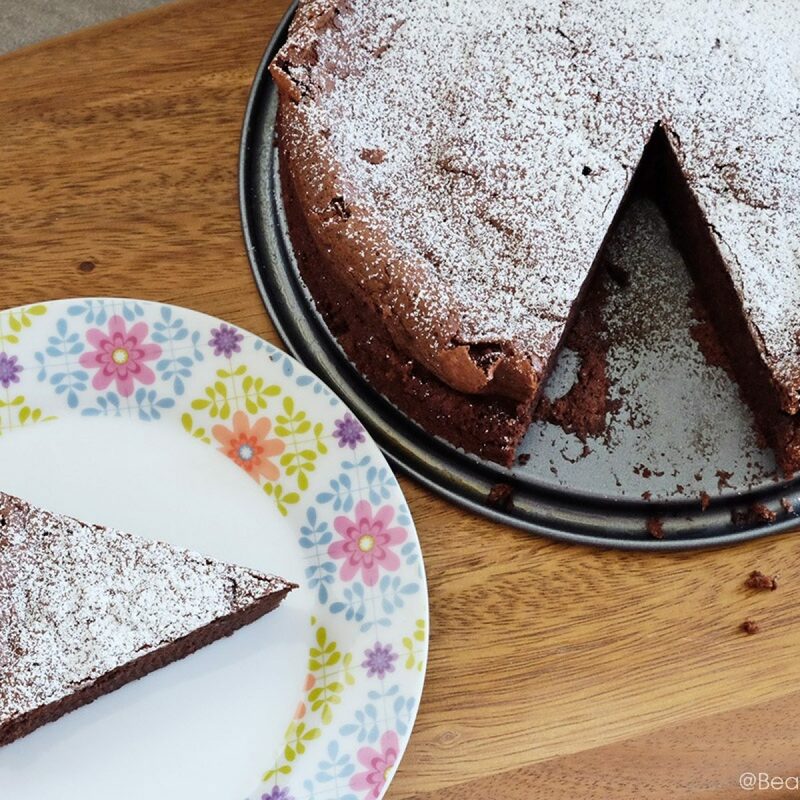 *It is important to turn off the heat once the mixture starts to thicken. 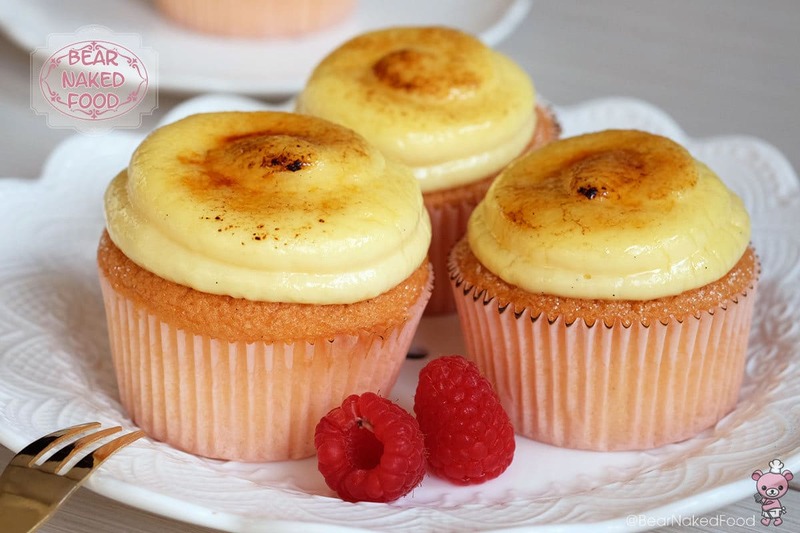 *The pastry cream will turn into a lumpy mess if you cook it for too long. 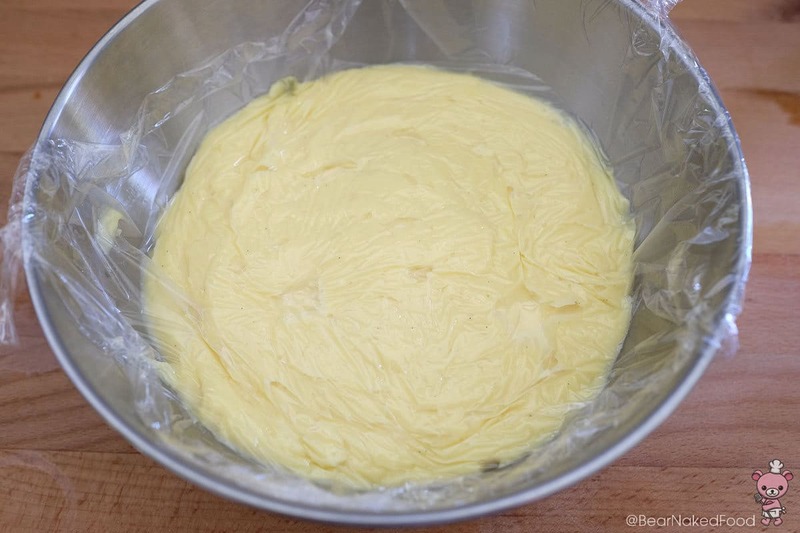 Transfer into a large bowl and cover the top layer of the pastry cream with cling wrap. This will prevent a skin from forming on the top layer. 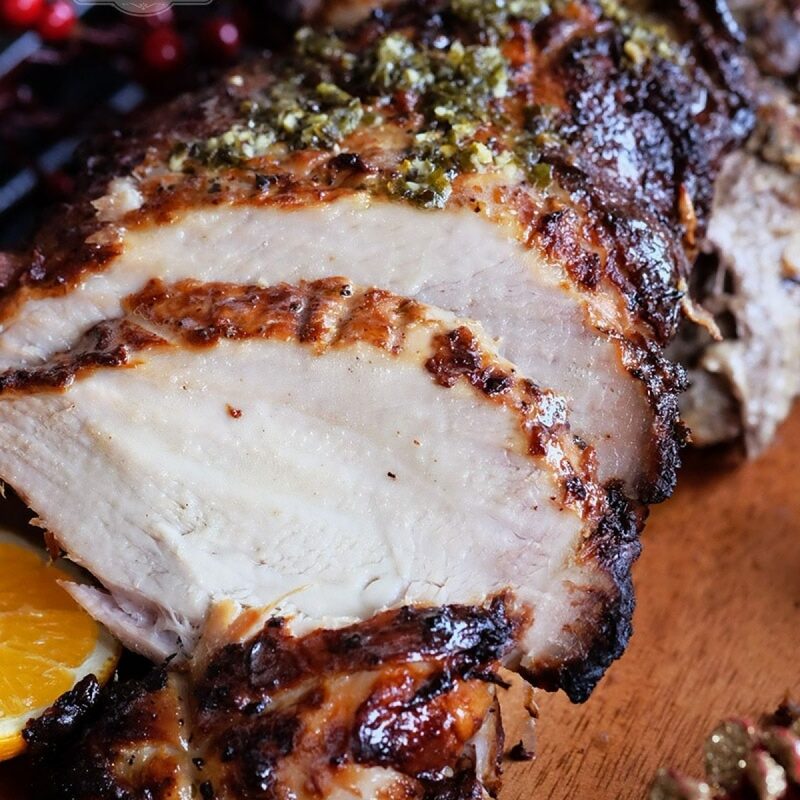 Cool at room temperature and transfer to the fridge and let it chill for 3 – 4 hours. 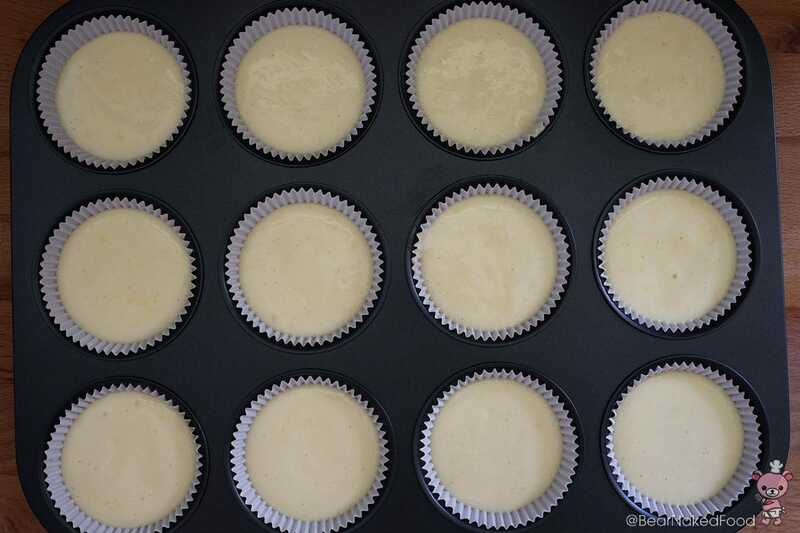 Vanilla Cupcakes: for step-by-step pictures, please click here. Separate the egg yolks and whites into two bowl. 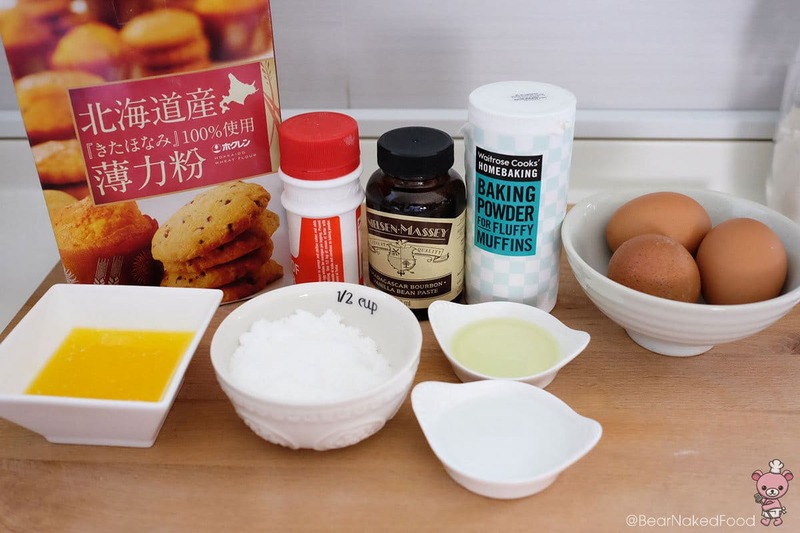 In a medium bowl, add in cake flour, baking powder and pinch of salt. Whisk together thoroughly until evenly combined. 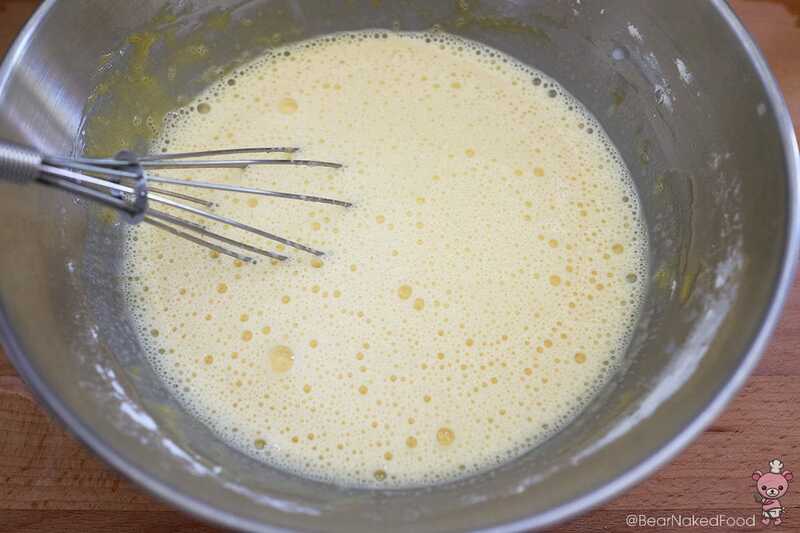 To the egg yolks, add in sugar and whisk until pale and fluffy, about 2 mins. Add in melted butter, water, vegetable oil and vanilla extract. Mix well. Add in the flour mixture and whisk until just combined. Add cream of tartar to the egg whites. Using a handheld mixer, beat them until foamy. With the mixer still on, slowly add in 2 tbsp sugar and whisk until stiff peaks just formed. 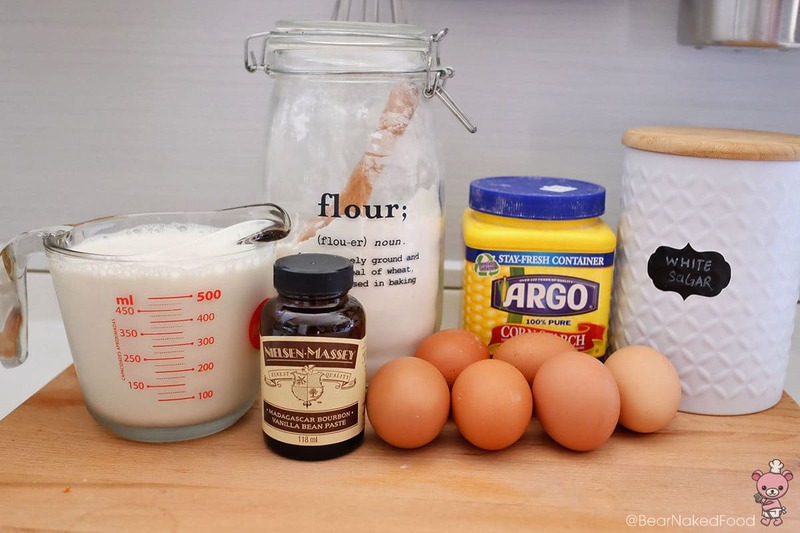 In 3 batches, add the meringue to the egg batter and fold gently until the mixture is just combined. 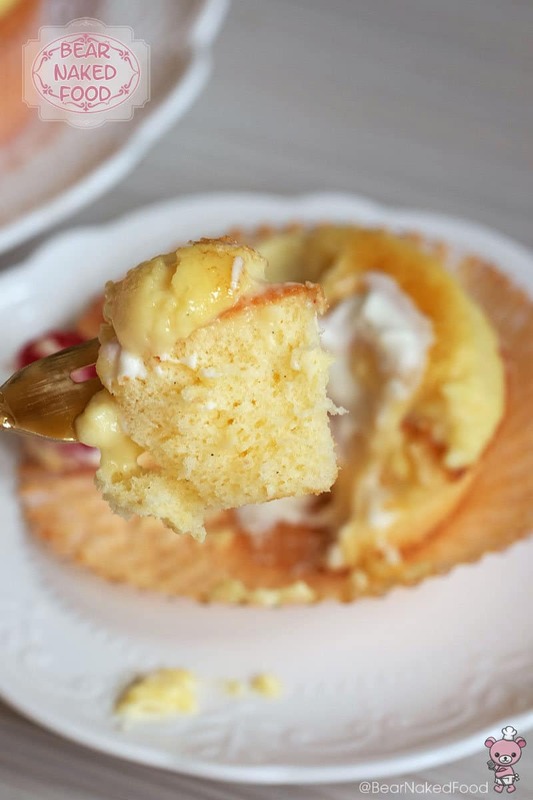 It is okay if you could still see streaks of meringue in the batter. 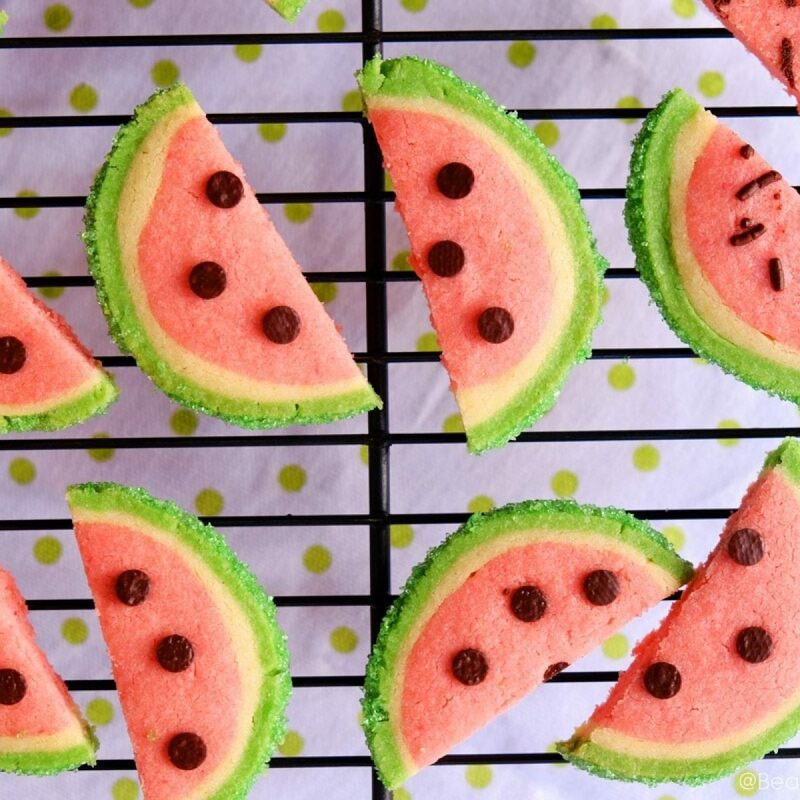 Tap the bowl on the counter a few times to release large air bubbles. 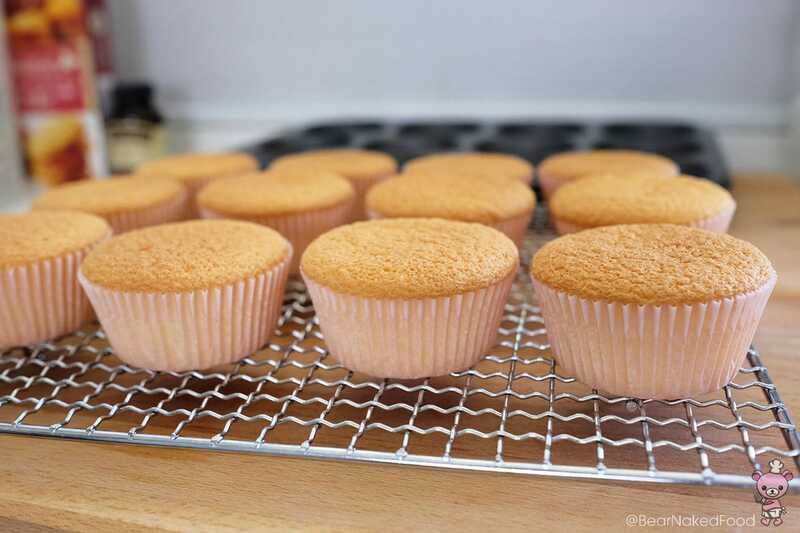 Line a 12-cup baking tray with cupcake / muffin liners. 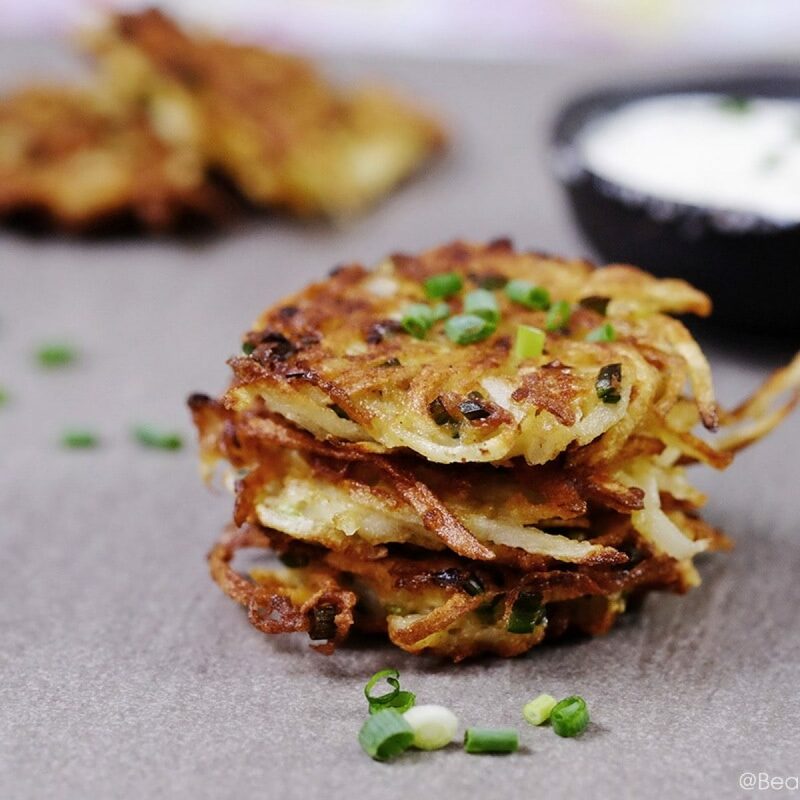 Carefully pour the batter into each liner, filling about ¾ full. I transferred the batter into a measuring jug for ease of pouring. Tap the tray on the counter a few times again to remove large bubbles. 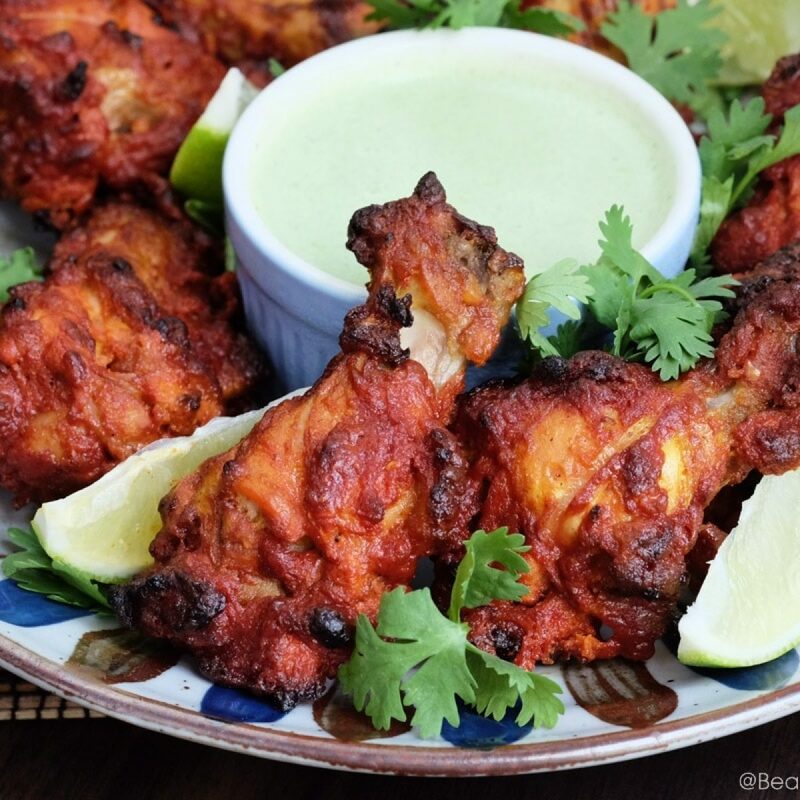 Bake in a pre-heated oven at 180°C/350°F for 15 mins, or until a skewer inserted comes out clean. Cool on a wire rack completely before piping the pastry cream on top. 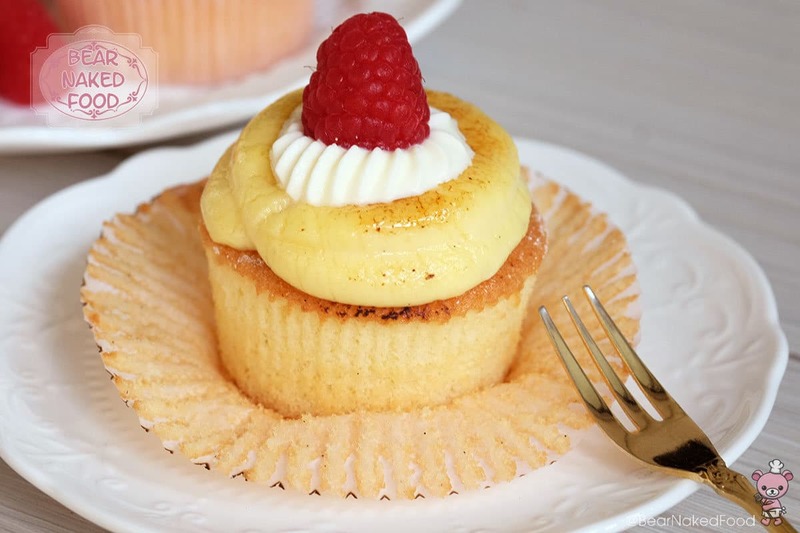 Whisk the cold whipping cream for 2 – 3 mins until soft peaks formed. 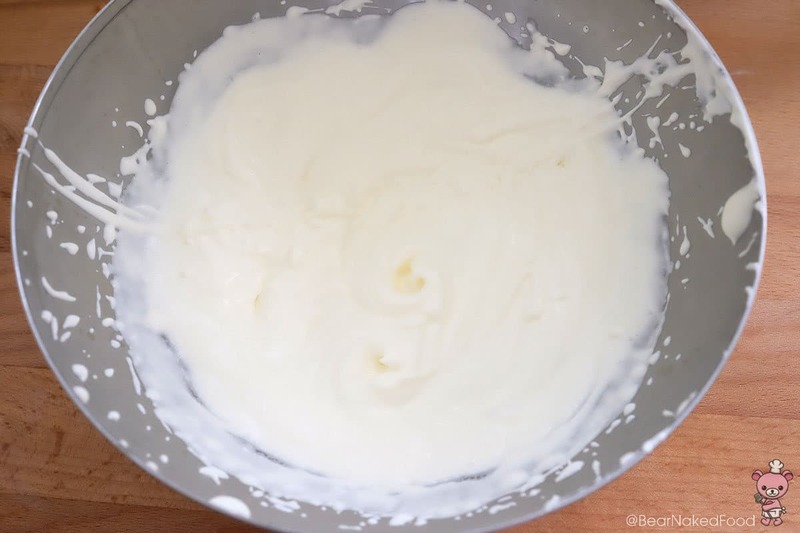 Fold ¼ of the whipped cream into the pastry cream. This will create a light and silky texture to the pastry cream. 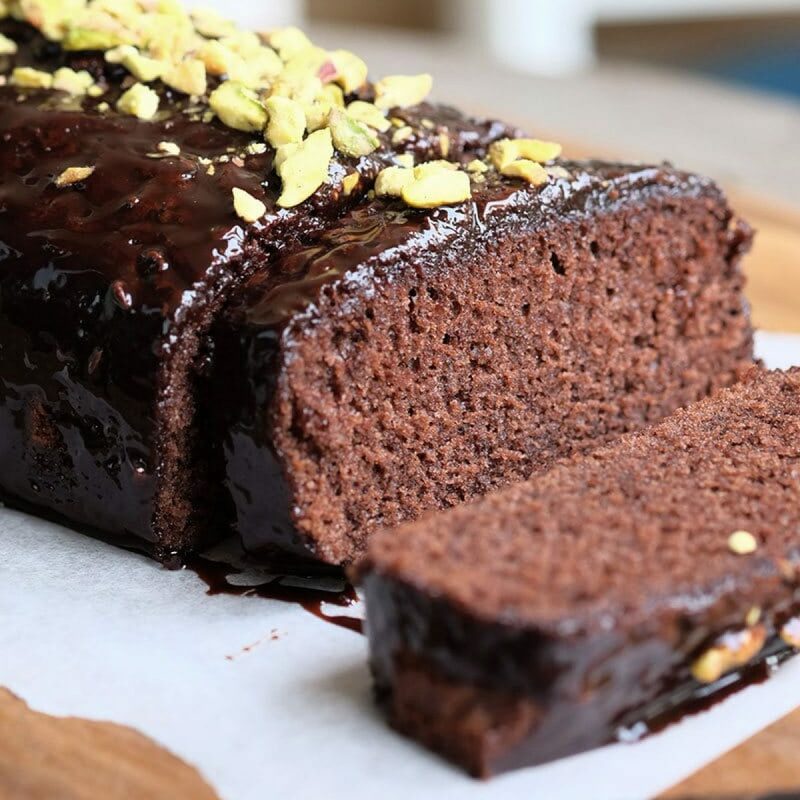 Repeat until you achieve a thick yet spreadable consistency. It might not be necessary to use up all the cream. Fill the pastry cream into a piping bag and snip off about 1.5cm at the tip. 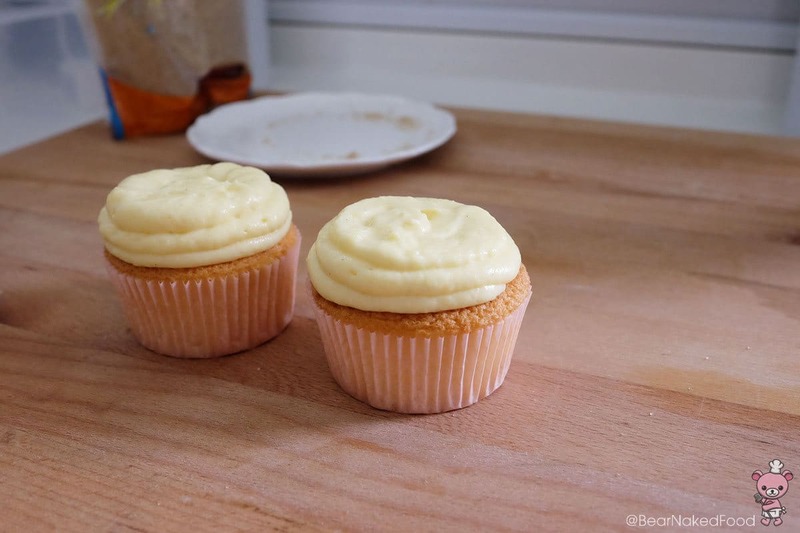 Alternatively, you use fit the piping bag with a Wilton 1A (1.5 cm) round nozzle. 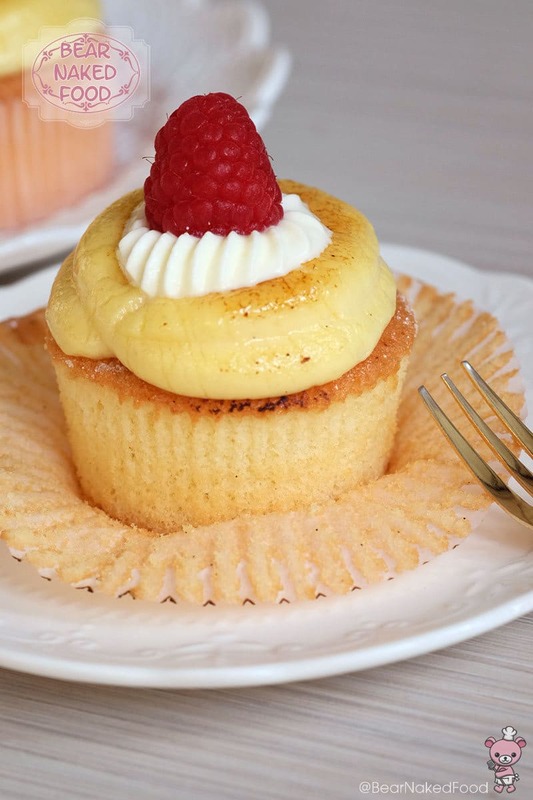 Pipe the pastry cream onto each cupcake into an even layer. 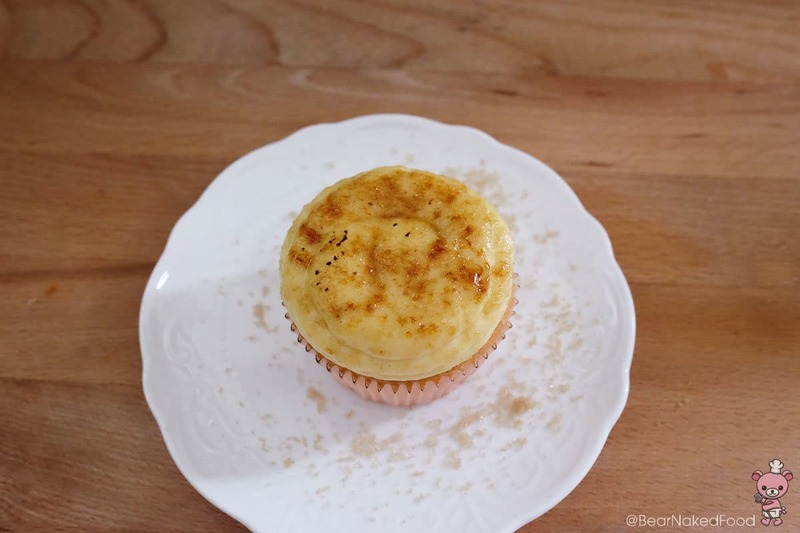 Sprinkle with granulated sugar all over the top and sides of the pastry cream and heat with a kitchen torch until the sugar caramelized into golden brown. 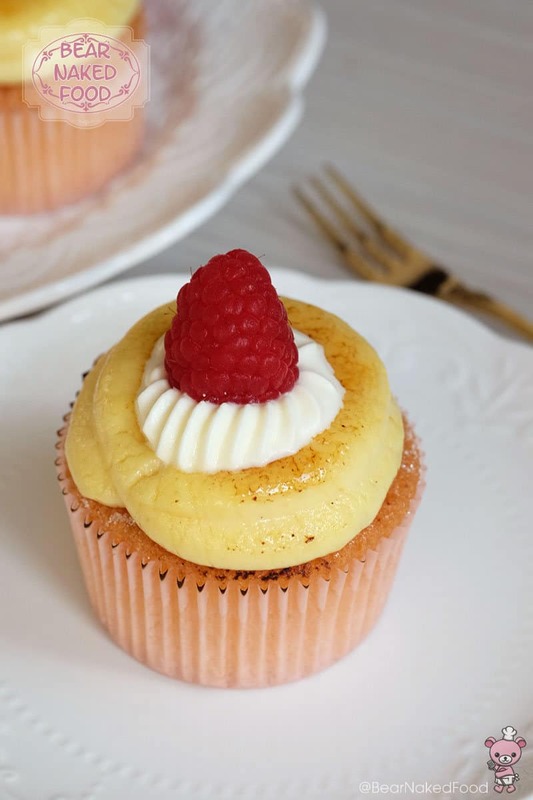 Top with remaining whipped cream and raspberry. Chill in the fridge for 10 mins for the sugar to harden. Enjoy. Pour ¼ of the hot milk into the egg mixture and stir continuous to temper the egg yolks and prevent them from scrambling. 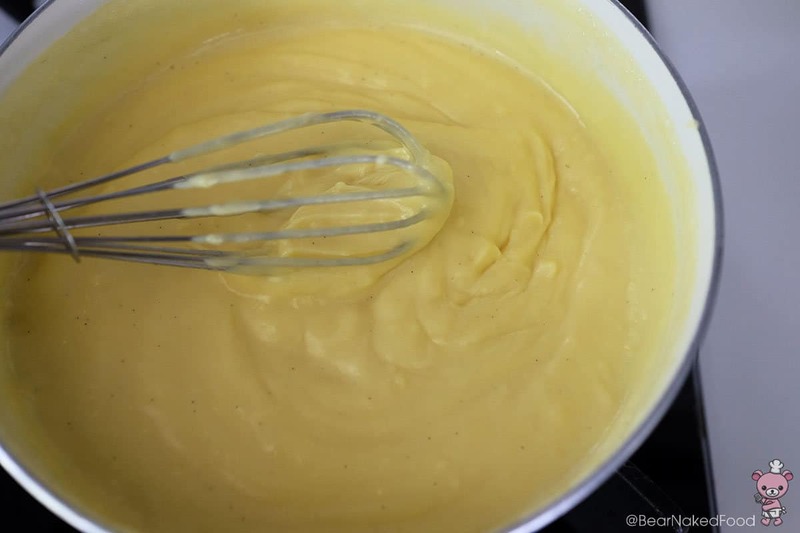 Transfer the egg milk mixture back into the saucepan and cook and stir continuously until it just thickens into custard. 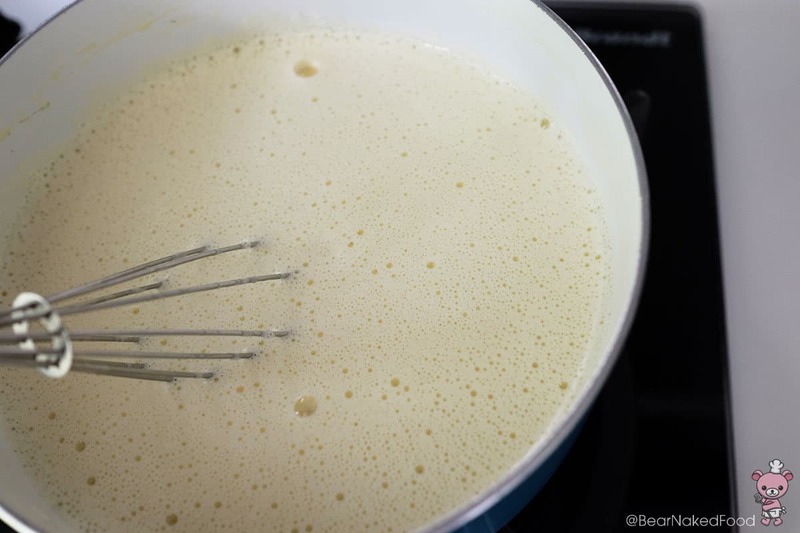 Turn off heat immediately and keep stirring as the heat will continue to cook the cream. Transfer into a large bowl and cover the top layer of the pastry cream with cling wrap. This will prevent a skin from forming on the top layer. Cool at room temperature and transfer to the fridge and let it chill for 3 - 4 hours. Chill in the fridge for 10 mins for the sugar to harden.